Diana carefully hand picks each stone and shell, then designs and hand wraps it in sterling silver or gold, using no machines or soldering. 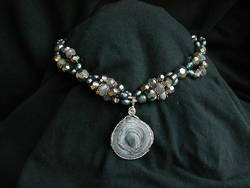 Diana’s own unique style of wrapping follows the markings or texture of the stone or shell, enhancing and honoring its natural beauty. No piece is exactly alike. Each Jewel of the Earth is a wearable work of art, individually signed by the artist, Diana. 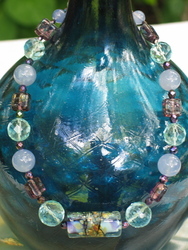 Dana uses Diana's Jewels' of the Earth in her Aurora Series of jewelry. 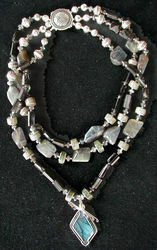 Aurora Line: Labradorite pendant by Diana March on a three strand labradorite, black tormaline, jade and silver necklace. Handcrafted lampwork and silver jewelry components, Swarovski crystal, Czech glass, freshwater pearls, semi-precious stones, and finished jewelry. 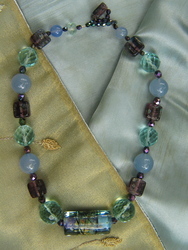 Dana uses Lisa Kan's glass beeds as the center of her Haiku Series of jewely designs.